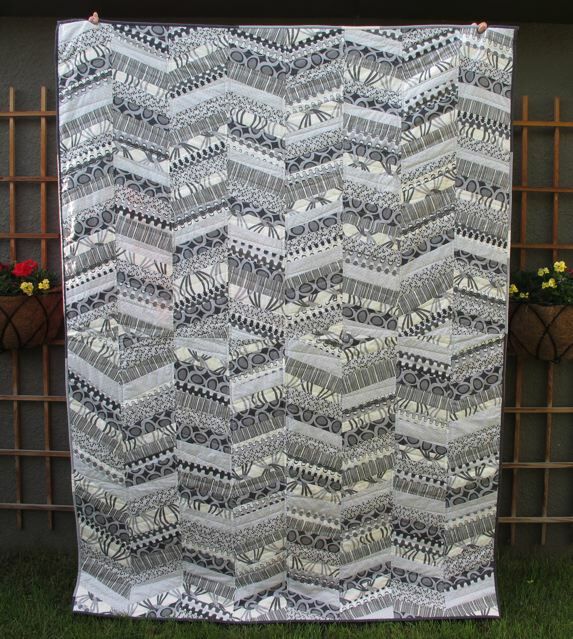 This is my latest finish, my Shades of Grey quilt. And guess what? I'm offering it as a pattern for sale! You can get it at my new Etsy shop. 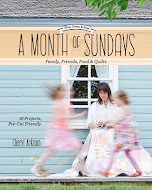 If you've been reading here for any length of time you know that I will always encourage other quilters to do their own thing. To take an idea, inspiration, or even a pattern and make it their own. This pattern is written that way. 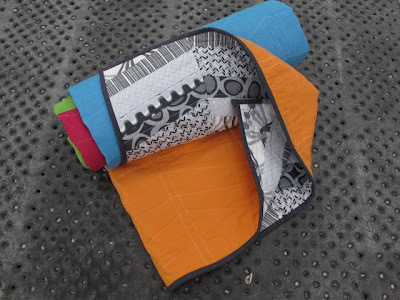 It provides the technique and the basics to make a quilt like this, but I also provide tips on making your own size, your own colour, and even with variations in design. Of course, that's not to say you won't make it a way I haven't even thought of! 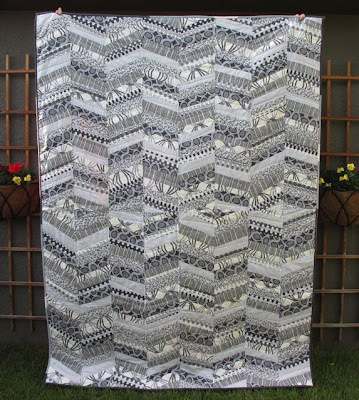 Or that you don't love it as is and want to make it exactly like this quilt. This quilt and pattern wouldn't exist with the support, inspiration, and work of Jan DeCinto, the force behind Daisy Janie. 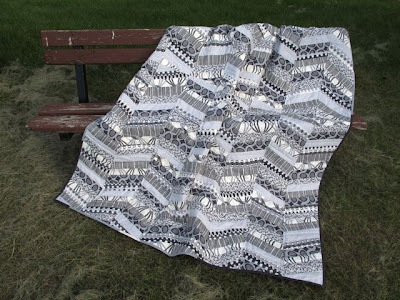 The design itself was inspired by one of the fabrics in her Shades of Grey line and she helped me tremendously in getting the pattern itself together. To pick up her fabric check out her list of retailers. - The top is entirely made from Shades of Grey organic fabrics. - I used a bamboo batting to try something different. - The back is made up of wide strips of Kaffe Fassett shot cottons. I chose those intentionally to have a lighter material on the back. With a foundation fabric in the top I wanted to lighten up the quilt overall. - It is quilted with an organic thread. - Pieced binding with Kona organic solids. Thank-you, readers, for continuing to inspire and push me to be a little bit more than I was yesterday. Great quilt! I too love that "stocking stitch" fabric, you see herringbones, I see knitting but then I am also a knitter! I especially love the middle bit, a nice touch. 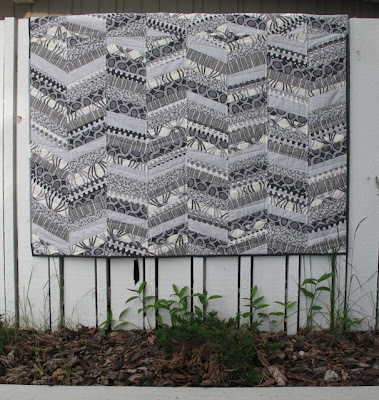 I love how this quilt came together and the subtle detail of switching direction in the middle. So exciting it's a pattern! Congrats! Great design - and I appreciate that flexibility in a pattern. Great pattern, congratulations! 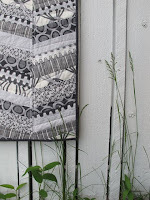 I love seeing new ideas for quilts. It's fantastic Cheryl! Love the Shades of gray collection! Wow. Great design, Cheryl. I've never been one for the colour gray, but your quilt has changed my mind. cheryl, this is so fantastic! i love the quiet quality of the grey on the front and the wonderful brightness of colour on the back! congrats on your pattern. 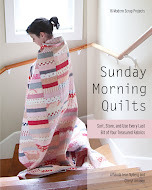 and thanks for encouraging us quilters to make a pattern our own. it's freeing. Wow! 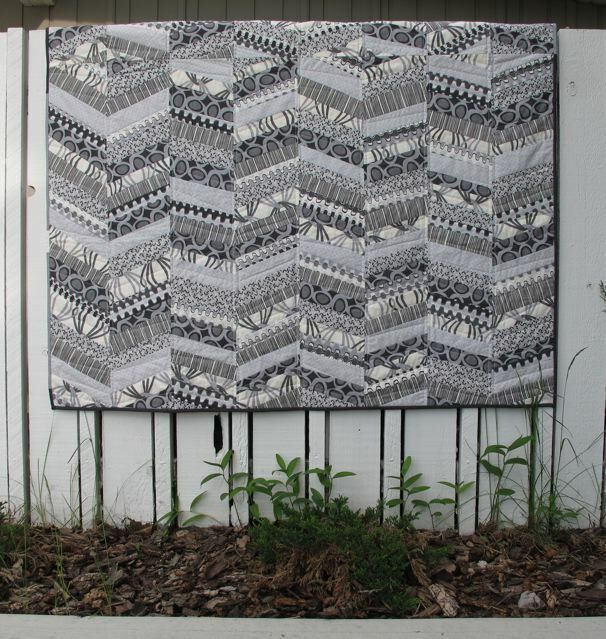 The only thing missing about this quilt is more pictures of the back! 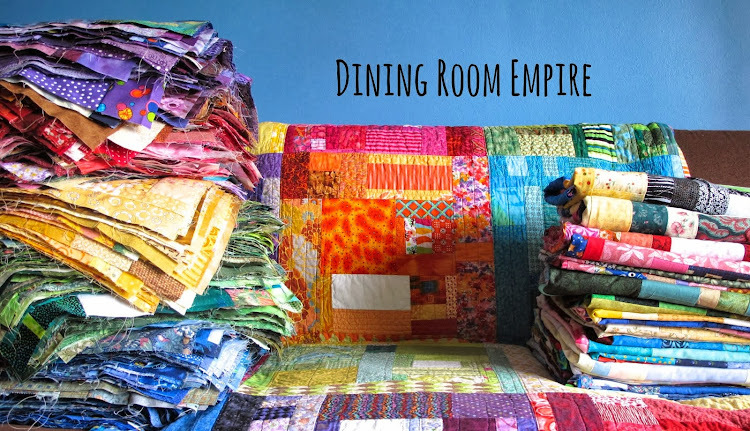 I love the dramatic change from front to back and the wonderful accents the quilting gives. Looks lovely. And I might be imaging things but I somewhere remember a story on your blog with you having your legs up in socks the same type of colors as the backing. Like you put a very nice part of yourself into this quilt as well! This is just beautiful! I love all the "Shades of Grey" in both senses of the words. 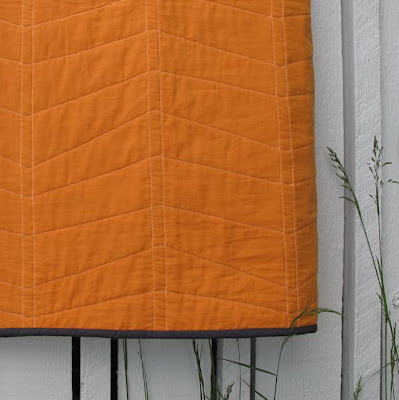 This quilt is awesome--fabrics, design, and simple quilting. Well done! Nicely done. Great photos, Cheryl. I love this quilt. And I love Jan's fabric! Love it. Just quilted whole cloth baby quilt in the herringbone. So easy! I somewhere remember a story on your blog with you having your legs up in socks the same type of colors as the backing. Beautiful Quilt! The grey front and bold colored back make a fabulous combination. And Congratulations on opening your own Etsy shop! Have a great long weekend and good luck with all those triangles! This quilt is utterly fantastic, Cheryl! Congratulations on opening up your Etsy shop. Good luck on your next step! fantstic - love the black and whites with the pop of colour on the back.